With Thanksgiving having just passed, we start preparing for Christmas. A popular tradition in anticipation of Christmas is the Advent calendar, which is really a December calendar since Advent begins before December 1.While December is next week, I thought I'd put this out there now for those who like to think and plan ahead. Many people mark each day of November by sharing something for which they were thankful. Let's use December to do something nice for others (besides gift giving for Christmas). 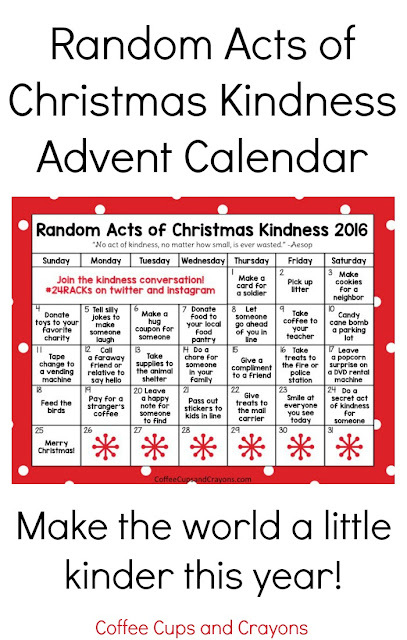 Let's practice some random acts of kindness! If I remember, I'll tweet the daily suggestion.